When we walk with the Lord, we are constantly seeking ways to emulate and imitate him. It is a freeing and joyful thing to know your performance does not affect your salvation. It is, however, critical to remember as God’s kids that our behavior and actions speak volumes about who we are and who we serve. John spent an entire letter to praise his friend for his representation of God in his life. In addition, he encouraged him to continue to cultivate the attitude of service and community that he lived. In our lives, we are often tempted to withdraw, withhold and simply walk away from serving others. It is messy, risky and often completely thankless. But, when we die to ourselves and pour our lives into others, they do not see us–they see the Father who loved us and gave himself for us. We derive great joy in simply seeing him glorified. We can never give up. We can never withdraw and we can never forget that the one who died for us is God himself—who considered us a treasure and gladly did what was necessary to restore us to his family. Help me Lord to serve with humility and joy. 5 Dear friend, you are faithful in what you are doing for the brothers and sisters,[a] even though they are strangers to you. 6 They have told the church about your love. Please send them on their way in a manner that honors God. 7 It was for the sake of the Name that they went out, receiving no help from the pagans. 8 We ought therefore to show hospitality to such people so that we may work together for the truth…11 Dear friend, do not imitate what is evil but what is good. Anyone who does what is good is from God. Anyone who does what is evil has not seen God. Ruth 4 final–you can’t make this stuff up. Disney could not of created a better story. Ruth married Boaz. Their great grandson was David—A man after God’s own heart. The King that would unite Israel and finally bring peace to God’s people. David the patriarch of Jesus. All from a Moabite woman that refused to leave her dear mother-in-law in a desperate situation. So many times, the selfless act we complete carry such huge dividends that we are unable to get or minds around them. Neither Ruth or Boaz acted the way they did for the impact and reward that followed—they simply acted in a way that honored God. In our lives we do the same thing. We often take steps to honor God with no expectation of changing the world…Yet, the world gets changed because we did. That should be motivation enough to always behave in a manner that is worthy of the Gospel. We may never see the impact, but, by faith we can know that God’s plan is flawless and our willing obedience and submission is a recipe for blessing and success. Then, when we stand before him the crowd will roar and we will say, “what is all the fuss—and they will respond—Great job my friend the world was a bit different, because you changed it for the Lord!” Well done—my good and faithful servants. Author Michael SmithPosted on May 31, 2013 Categories DevotionsTags adversity, amazing journey, daily study, daily walk, dear brothers, devotion, disney, eternal perspective, faith, faithful, fear god, Grace, joy, mercy, prayer, Ruth, submit, Thanksgiving, The Amazing Journey, theology, walking daily, What des God Look LikeLeave a comment on Ruth 4 final–you can’t make this stuff up. What a fairy tale scenario. Ruth the young widow returns from Moab to help her Mother-in-law. She works in the fields scraping enough food to keep her and her mother-in-law alive and winds up as the wife of her redeemer, Boaz. This was no wedding of convenience, it was a selfless and sacrificial act of Love. Boaz trusted God and offered her up to the neighbor who had the legal right to gain Ruth and her lands. Ut, God had a better plan. God caused there to be only one answer—Boaz and Ruth to live happily ever after. When we follow God, his paths can seem awfully strange, sometimes. The road seems dark, the circumstances grave—but God on his throne is always ready to execute the greatest plan of all. Ruth and Boaz were to be married and what happened next, well, that is truly a fairy tale end. There is a certain character of a gentleman. It is a combination of class and chivalry. It is engrained and obvious in everything that he attempts. The way he treats strangers, the way he treats women and the way he responds to opportunity all show a selflessness that makes him beloved to all he comes into contact with. That was the Character of Boaz. He made sure that Ruth was not embarrassed, he made sure she knew that he had listened. In addition, he made sure she knew he would follow the rules and preserve her reputation. Finally, he made sure she went home with adequate provision for her and her mother-in-law. As Godly men, we are to have the same character. We are to be selfless, honorable and men of integrity. All that we do should reflect the very nature of God. When we live our lives that way, we stand out to those we know. They want to be a part of our lives and they want to know what makes us different. When they learn it is our restored relationship with God, they want to be a part of the family as well. We will never know the impact we will have as we journey through life. But, we know that how we live can impact lives daily and eternally. Father, help me to live in a way that honors you and blesses others. Ruth 3 part 1–A Hot time on the Threshing Floor Tonight! We must be ready to take steps to execute God’s Plan. In the Great Commission, Jesus tells us that as you are going, make disciples…So often, we are afraid to take steps for fear we are going to miss God’s plan. Conversely, other times we simply strike out on our own without thought or prayer assuming we know better than God what is best for us, In Ruth, we see the place where God lies in the continuum. Ruth listened to her Godly mother-in-law. Naomi trusted God and followed his lead. She instructed Ruth to look and be at her best, but to do what she is told, not make things happen. That is what Satan would have us do–simply help God out. There is a balance. In our lives, what we do, where we go all are significant to God. He wants us to be sensitive to his leadership. He does not want us to live paralyzed and afraid to face life. We need to walk humbly–but boldly each day seeking him in prayer and listening to Godly men and women he has placed in our lives. We then study his word and hide it in our heart–Finally we go and as we go we seek, listen and ask for his leadership in our lives. As we do, we see amazing answers and know his presence is with us guiding us to a full and meaningful life. We must not be afraid–we must simply trust and obey. God Bless You and those amazing folks that died so we can remain free. Author Michael SmithPosted on May 27, 2013 May 27, 2013 Categories DevotionsTags adversity, amazing journey, daily Devotion, eternal perspective, faith, guardian reedemer, Light, majesty, provider, refining, Thanksgiving, What does God Look LikeLeave a comment on Ruth 3 part 1–A Hot time on the Threshing Floor Tonight! Ruth had by “coincidence“ stumbled into the field of the family’s guardian redeemer—Levitical law said that if you have a relative that has fallen into hard times, as a close relative you were to assist them to get back and going again. What a concept—if a part of the family is struggling then pitch in and assist them in getting free. God directed Ruth to that person and he also directed Boaz to fill that role. God’s plan demonstrated and shows how he cares for each of his own. Today, we as a family of believers are called to do the same. We are to pour our lives into those that are struggling to assist them in getting free. We, like Boaz, must be proactive in our generosity and assistance. There is nothing we have that cannot be gone in a blink of an eye. We, therefore must hold on loosely and share liberally. God will bless our generosity. He will make our accounts balance. He says in Malachi—“Trust me, try me, prove me-says the Lord of Hosts; and see if a blessing—unmeasured blessing will not fall out on you!” We cannot out give God, and we cannot ever go wrong by taking on his character traits! Ruth had no idea what God had in mind. She left her family and returned to Bethlehem with Naomi—her dead husband’s mom. She committed not only to follow Naomi, but also to follow the Lord. Job one was to provide for Naomi. She decided to do the only thing she could—pick up the left over wheat—Gleaning the field. She had no plans except to trust God to provide. She ended up in a field owned by Boaz. Boaz admired Ruth for her care of Naomi and her work ethic. The result was that he allowed Ruth free reign in gathering what she needed to survive and even made it pleasant for her. Her faithfulness was rewarded. God watches as we fill our days. He sees our selfless nature and work ethic and seeks, like Boaz, to meet our needs. Ruth was not serving to earn Boaz blessing; nor—are we performing to earn God’s favor. The simple fact is that we love to bless those who are selfless, those that do everything in a manner that is worthy of the gospel. So does our Father take joy in the blessing of his kids that model that character. As we endeavor to become like Christ, we “Glean” many of his blessings he wants for us. Help me, Lord to glean the fruits of your spirit and the blessings of your hand. 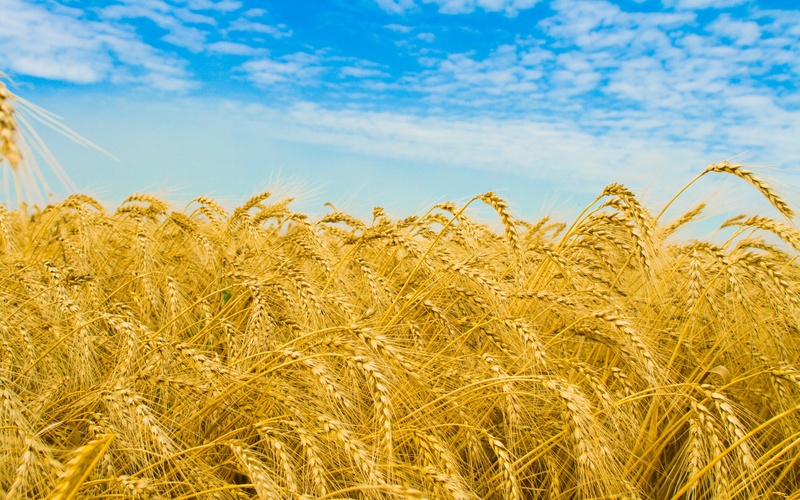 Naomi said to her, “Go ahead, my daughter.” 3 So she went out, entered a field and began to glean behind the harvesters. As it turned out, she was working in a field belonging to Boaz, who was from the clan of Elimelek.4 Just then Boaz arrived from Bethlehem and greeted the harvesters, “The Lord be with you!” “The Lord bless you!” they answered.